The Church in New York State is as diverse and multicultural as any in the world, and contributes immensely to the spiritual life of the state, as well as being the largest non-governmental provider of health care, human services and education. 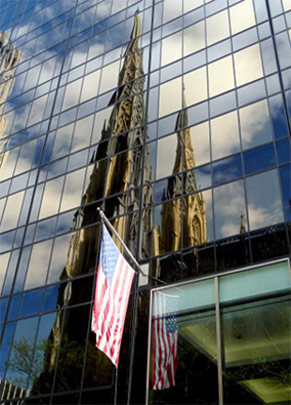 Catholics represent the largest single religious faith in New York, numbering approximately 7.3 million out of a population of 19.3 million. The Church in New York State is made up of eight dioceses, which are geographic areas under the spiritual leadership of a diocesan bishop. They are the Archdiocese of New York and the Diocese of Albany, Diocese of Brooklyn, Diocese of Buffalo, Diocese of Ogdensburg, Diocese of Rochester, Diocese of Rockville Centre, and the Diocese of Syracuse. You can learn about the bishops of each New York Diocese here. The Catholic Church has been educating children in New York State for more than 200 years, providing a quality, values-based education and hope for a brighter future to children regardless of income, race, ethnicity or religious beliefs. The Catholic parishes of New York State provide valuable ministries to countless New Yorkers in need every day.